Rendering a fireplace basically involves spreading a layer of mortar (sand cement) over the brickwork. This can be a great finish in a cottage where a slightly more “rough and ready” look is the order of the day (where perfectly flat might look out of place). My top tip here is always to make sure your surface is wet (I use a weak PVA mix for wetting the wall). Part rendering can work very well, especially when some of the brick or stone remains on show whilst the rendering covers other areas. In the picture on the left rendering was chosen for the chimney breast and left and right internal fireplace walls. 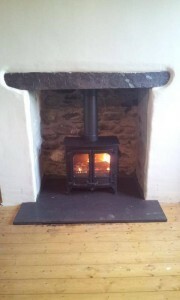 The rear of the fireplace is stone and was tidied up (pointed) to achieve a rather nice look. You can Google “render brick” or “render fireplace” for further information on this subject.